My parents just moved into a new house. Though it was very sad to see them leave a home that they had been in for over 20 years, I get equally excited about new beginnings. They are having fun fixing up and decorating their new place, but one of the things they miss most is their garden, filled with perennials they had planted and nurtured over the past 20 years. They will have a great time creating a garden in their new home, of course, but with all the new house projects in the works, the garden will have to wait. But thinking of their garden got me to thinking of housewarming gift ideas. Thao is not a gardener. 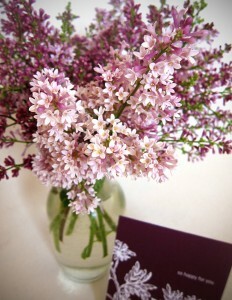 However, the lilac bush is expected to recover soon and show little to no ill-effects of the pruning. Shop our note cards or keep reading our blog for other housewarming gift ideas.